I'm Jayme, stay at home mom,apparel designer and owner of Lillipops Designs. I've been at the sewing machine, designing and stitching away since I was 4 years old. I'm all grown up now with three kids of my own, but I never lost my passion for creating beautiful, whimsical garments that any little girl would be delighted to wear. Greentwee is my way of showcasing talented artisans who are creating charming, eco-friendly products for children and stylish moms. I adore pretty & sustainable things and want to share my finds with you! My baby daughter's second birthday is coming up this June. I'm a tiiiiny bit obsessive when it comes to my kid's birthday parties. I'm not saying that I'm one of those ultra-competitive parents who spends thousands of dollars on a party. On the contrary... I prefer to make everything myself. Invitations, cakes (oh Lord... the cakes... I'll save that story for another time. Let's just say that my son's Spongebob cake last year was literally a pile of crumbs shaped back into a rectangle with about 3 inches of frosting holding it together), games, etc. Then the day arrives and I'm so stressed and thinking of the ways I could've done it better. I'm learning my lesson... just letting go and enjoying the moment. This year I'm going to let a professional do the invitations. I'm not talking about those Hallmark fill-in-the-blank numbers. I still want something totally unique and beautiful (just not involving me, Photoshop and scissors!). So I found this. Noulou Cards & Paper (at www.lilab.etsy.com) is such a wonderful discovery! 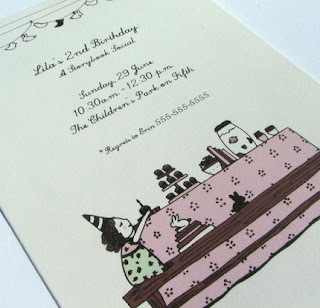 All the illustrations for these lovely cards and invitations are completely original. Fetching is the word that immediately came to mind when I saw the superheros, ballerinas, elephants and brides. Erin Moniotte's artistic style is charming and sweet without the syrup. Her line drawings are printed on eco-friendly recycled paper with all the pertinent information for your specific event. Now... if I can just think of the perfect cake (aka Pile Of Crumbs) to match. So mama has been a little off center the past couple of weeks. I know I promised to give you all some lovely things to look at everyday, and I apologize. I'm going to give Greentwee a fighting chance and I'm going to do my very best to keep it current. If only my three little munchkins would cooperate every one in a while! It's no secret that I am seriously caffeinated. Seriously. I have never been much of a breakfast person, but everyone here at the Lillipad knows that it's coffee first for mom. Then we'll talk. I'm always on the hunt for the perfect brew. I may not have found my dream java yet, but I did find the most precious and creative jewelry I've seen to celebrate both my passion for joe and my love of eco-friendliness! Brilliant! 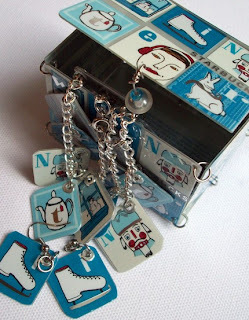 Jupita repurposed old gift cards (including my beloved Starbucks) into super chic, whimsical jewelry. I love her funky, colorful aesthtic and her unbelievably creative vision for something that usually ends up in the garbage. My darling husband is drooling over the awesome guitar picks too. I have a special place in my heart for craftspeople who think outside the box. I think of all the wonderful things that some people throw away and shudder at the waste! Josie, owner of WoolyBaby, has worked magic on castoff wool sweaters... transforming them into uber-stylish baby booties. Pure genius! 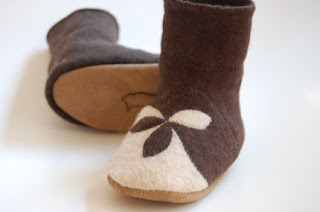 Even the leather soles are recycled (and feature the sweetest little sheep emblem). Her Etsy shop is delightful, with choices for both boys and girls that are altogether chic and sweet. The booties are made to order for your child's specific size. I only wish she made them for MY giant feet! Visit http://www.wooly-baby.com to shop. Let me start by saying that I am a blog junkie. I read more than a dozen every day... each contributing some unique to my day. Some are "mommy blogs", detailing the antics of adorable and sometimes naughty children. Some are design blogs, rife with amazing talent and inspiration. A few are snarky gossip and political blogs... and still a few more offer advice and insight into living a responsible and sustainable lifestyle. My hope for Greentwee is to encompass a bit of each of the blogs that inspire me everyday. You can expect to find parenting anecdotes (I have 3 children... all 5 years old and younger), original designs from both my Etsy shop and other craft tutorials, occasional sarcasm and hopefully, a huge dose of eco-fabulousness. If you create beautiful, original and useful pieces for children (or moms! ), I will find you. If you are in the market for these treasures, you've come to the right place! So join me... bring coffee. I promise to carve a few minutes out of my day to share something lovely. Let's get inspired!